A call to Yannis Mitsopoulos at Ocean Independence in Greece brings news of yet another price cut as his central listing, the 48.85m motor yacht El Chris, comes down by €500,000. She was built and launched in Bremen in 1960 at Lürssen, Germany, for the German Navy as a Type 140 Jaguar class Fast Attack Craft. She is constructed of wood and was named 13292 S-22 Dommel. In 1974 she was decommissioned and later sold. Between 1981 and 1983 she was completely rebuilt as a superyacht including new 1400hp Deutz engines and in 1983 she was re-launched. She was sold again in 1985, refitted and renamed. The 1985-1986 refit included a lengthening of 4.5m from 44.5m to 48.85m. Wooden/titanium frames were used for the hull and the superstructure above deck is built out of aluminium. In 2005 further refit work and updating was also performed. El Chris boasts two saloons, a separate dining area, alfresco dining on the upper deck and a large sundeck. 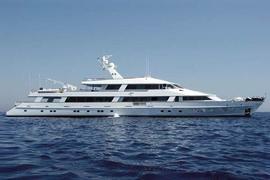 Accommodation is for 14 guests in a master suite, VIP cabin, a double and four twins and she cruises at 14 knots. The new asking price is €2.3 million.